EXO's Xiumin, Birthday electronic display board prepared by the fan club. 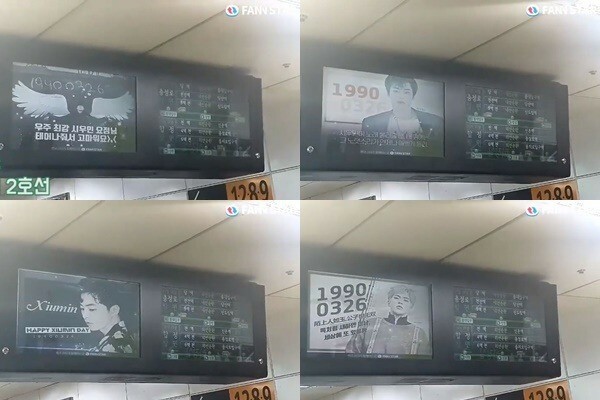 [The Fact] An idol weekly ranking website FAN N STAR operate by The Fact, unveiled an electronic display board that is being shown in South Korea, successfully supporting the birthday of the group EXO Xiumin. On 26, FAN N STAR released a photo of Xiumin 's birthday celebration video, which is being shown at a subway display board on Line No. 2 in Seoul. On the 1st, FAN N STAR held a birthday support event for Xiumin and achieved 100%. This has confirmed advertisements for 43 subway stations on line 2 in Seoul from 26 to April 1. The released video lists the mentions and comments of the fans who participated in Xiumin's birthday support. The nick name 'xiupermin' said "Thank you for being exsit and the greatest Xiumin fairy in the universe," Nick name 'xiu민석아' said , "When Xiumin sings, the song always sounds pretty to my ears."